Crafted of high-quality die cast zinc base metal, the Liberty 3-3/4 in. Venetian Bronze Scroll Edge Pull offers simple styling that is designed to enhance the look of any kitchen. Rear mount installation. Mounting hardware included for easy installation. Simple yet sophisticated, the Cameron pull offers a perfect finishing touch for your room. The traditional design offers subtle detailing that complements a wide variety of décor styles. Ideal for both cabinetry and furniture. 3 in. Raised Panel Stepped Pull The Liberty 3 in. 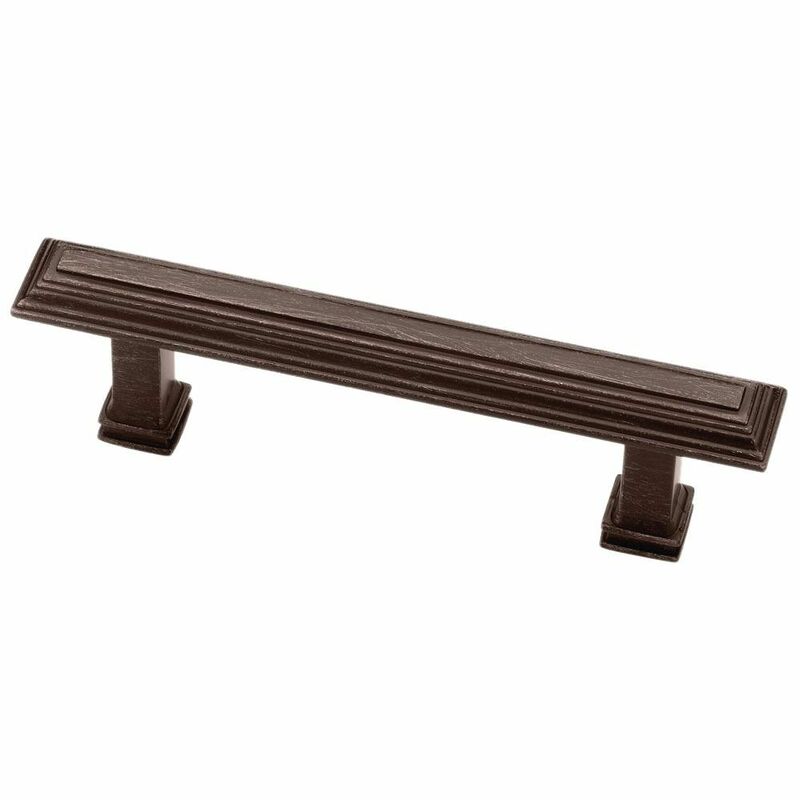 Venetian Bronze Raised Panel Step Pull lends its professional look to traditional-style cabinetry very well. It features a 3 in. center-to-center design for easy installation. The metal base material is built for longevity and is covered in a vintage bronze finish. 3 in. Raised Panel Stepped Pull is rated 5.0 out of 5 by 21. Rated 5 out of 5 by HomeDepotCustomer from Love them...bought one to try out from the store. ... Love them...bought one to try out from the store. Went back to fiinsh out my project, no longer in-store. Luckily found them online...perfectly perfect. Good color too. Rated 5 out of 5 by JoeyV from looked great with our new cabinets.... looked great with our new cabinets. Rated 5 out of 5 by Nick from Nice handles. I have oak cabinets that I painted white... Nice handles. I have oak cabinets that I painted white and put these handles on and it looks great. Rated 5 out of 5 by BudgetDesigner from This is the second home we have purchased these to... This is the second home we have purchased these to use on the cabinets! We love the classic look of these handles that compliment almost any decor style. They are a timeless statement piece that really dress up our cabinets and drawers in the kitchen, office, master bath, guest bath, & laundry! Rated 5 out of 5 by Newhousemama from We love them.... We love them. Rated 5 out of 5 by HomeDepotCustomer from Handles are beautiful... updated the oak cupboards nicely. Fit... Handles are beautiful... updated the oak cupboards nicely. Fit perfectly. Sturdy! Quick delivery! Rated 5 out of 5 by Jim from Strong looking handles accent our kitchen perfectly. A bit on the expensive side, especially when... Strong looking handles accent our kitchen perfectly. A bit on the expensive side, especially when we needed 27 in all but worth the expense for the ultimate look. Rated 5 out of 5 by ginny from I have used these exact handles several places after seeing them used on Pinterest. I have used these exact handles several places after seeing them used on Pinterest.